While we were able last week to bring you the official Zelda timeline, courtesy of the series' new art book, it was only the barest of structures, with just game names in chronological order. Now that the book has been out for a few days, more comprehensive translations are available. 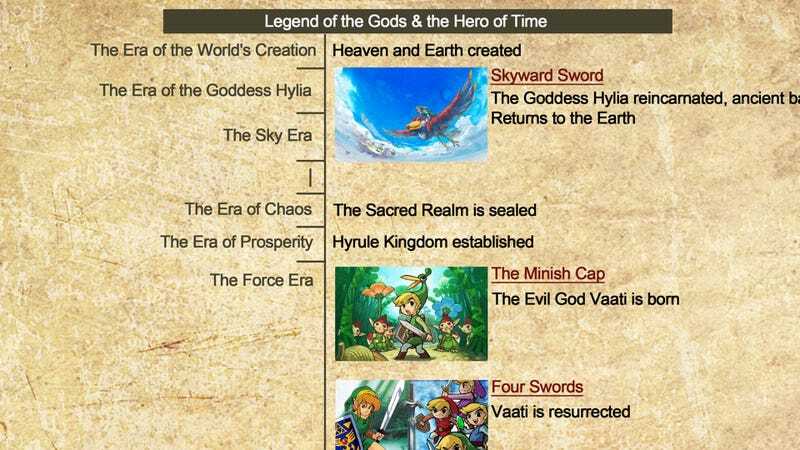 In addition to listing the games in order, the book also provides some additional background information and commentary, along with names for each of the disparate "eras" in the parallel Zeldaverses. The new info, and image below, is courtesy of translation hero GlitterBerri. The added translations also reveal that the book's "supervising editor" was none other than Zelda boss Eiji Aonuma, so yes, this is as official as official gets.